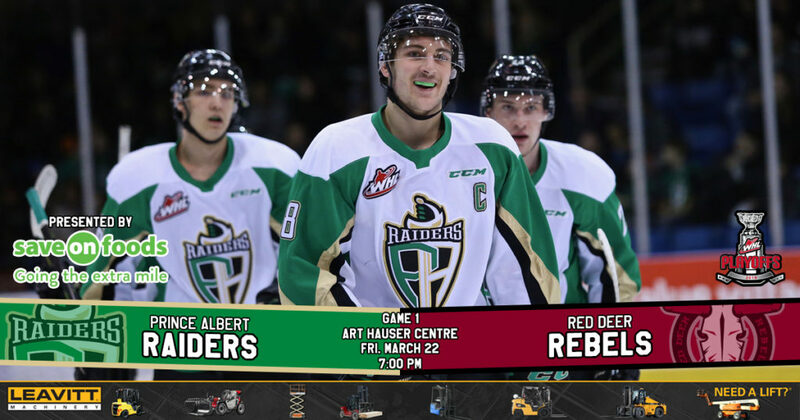 RAIDER REVIEW: The Raiders (54-10-2-2) begin the 2019 WHL Playoffs tonight as they open their Round 1 best-of-seven series against the Red Deer Rebels (33-29-4-2) at the Art Hauser Centre. The Raiders won the Scotty Munro Memorial Trophy as the regular season champion this season by compiling 112 points on the year. Brett Leason led the team with 89 points (36 goals, 53 assists) in scoring this season. Red Deer locked up the second wild card spot with 72 points this season. Brandon Hagel was the Rebels’ top scorer with 102 points (41 goals, 61 assists) on the season, which was also fourth overall in the league. VS. RED DEER: The Raiders won the four-game season series with the Rebels 3-1-0-0. Two of those victories came at the Art Hauser Centre. In the last meeting, the Raiders edged the Rebels 2-1 in a shootout on March 1. 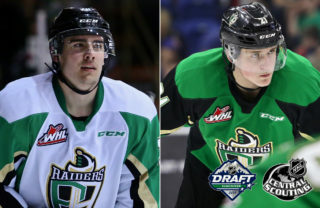 WHL AWARDS: Five members of the Raiders organization were recognized by the WHL on Wednesday with the WHL Conference Awards and All-Star Teams. Marc Habscheid was named Eastern Conference Coach of the Year; Curtis Hunt was tabbed as the Eastern Conference Executive of the Year; and Ian Scott took home the Eastern Conference Goaltender of the Year. Scott joined winger Brett Leason on the Eastern Conference First All-Star Team. Captain Brayden Pachal was one of the defencemen on the Eastern Conference Second All-Star Team. SETTING RECORDS: Ian Scott’s name is all over the Raiders’ record book following his stellar regular season that earned him the Eastern Conference Goaltender of the Year. The Toronto Maple Leafs prospects 1.83 goals-against average surpassed Rejean Beauchemin’s mark of 2.32 set during the 2003-04 season. He also set the new standard for save percentage with a 0.932 percent clip. Scott also set the bar for consecutive scoreless minutes at 185:44 and shutouts in a single season with eight. PLAYOFF STREAKS: Ottawa Senators prospect Parker Kelly enters the 2019 WHL Playoffs on a three-game scoring streak in the post-season. Kelly had three goals and an assist in the final three games of last year’s series against the Moose Jaw Warriors. This year, he also begins the WHL Playoffs on a six-game point streak. Over his final six games of the regular season, the Camrose, AB product had six goals and four assists. NEXT UP: The Raiders and Rebels play Game 2 of their best-of-seven series on Saturday night at the Art Hauser Centre. Puck drop is 7 p.m. Tickets are available at raiderhockey.com and the Raider Office.